Your wedding day is one of the happiest, and most memorable days of your life. As such, you want to ensure you look as radiant and graceful in your pictures, as you feel inside. Many brides worry about how they are going to look in their beach wedding photos – to the point that they look rigid and anxious in their final images. Be yourself. As you show your true personality it will reflect in your photos as being very natural and at ease. Laugh often. Show off your happiness and joy. It’s contagious in real life and in photos. Be in the moment. When you are present your photographer can capture the true emotion, laughter, excitement, and romance. Focus on your new spouse and not the camera lens. Look into his eyes and savor the moments of your one of a kind, special day. Relax. Relax and trust your photographer to cover all important aspects of your special day. As you relax mentally remember to relax your body as well. Relax your jaws and your smile will appear natural. Relax your shoulders and your neck will look more elongated and graceful. Attain and locate your optimal position in front of the camera. Drop your shoulders and bring your chin forward and down. Turn your shoulders to a 45° angle to the camera for a slimmer body look. Keep your feet shoulder distance apart with your weight on your back foot and your front knee slightly bent. This position will narrow your hips and create a flattering waistline. Utilize natural light. For the indoors photography always look for a room with large windows that will allow natural light to flood the room. It will create lovely flattering look on your skin. Make sure your reception is well lit. You may want to consider hiring a lighting company to light up your reception area well. Remember different areas, like the dance floor, table centerpieces, dessert and cake table. The candle look is fabulous but often needs to be supported by extra lighting from some gorgeous chandeliers. The chandeliers in themselves will bring the decor of the reception up another notch. Declutter your getting ready room. Not only will it aid in lovely looking photos through keeping distracting clutter from stealing away the focus from you but also you will score some major brownie points with your photographer. Surprise your photographer with an orderly room! He will not be expecting this! Don’t worry, it’s not just you, that’s a norm. But if you toss out some extra tasks to your lovely and energetic bridesmaids, you can have picture perfect getting ready room in a jiffy. Obtaining the slimming look. To appear slim or slimmer in your photos, keep one shoulder towards the camera and avoid facing the camera straight on. You can also hide ever so slightly behind the groom or tuck into his under arm area. You can also use the vail to your advantage to cover your naked arm if your dress is sleeveless. Keep your arm slightly away from your body to add a toned look. Relax your hands. It’s easy to forget about your hands. After all we focus so much on the face. But photographs reveal it all. So take a deep breath and let your hands relax down on your sides, gracefully. My thoughts about beauty. Beauty is in confidence, love, and happiness. Rest assured that on this special day you will look fantastic! No matter what your body type or your personal perception is. You have a team of professionals making sure that this happens. Your hair, make up, that fabulous dress that you took weeks to pick and finally your hard working photographer. So believe it and be it! It’s all going to come together and radiate for you! 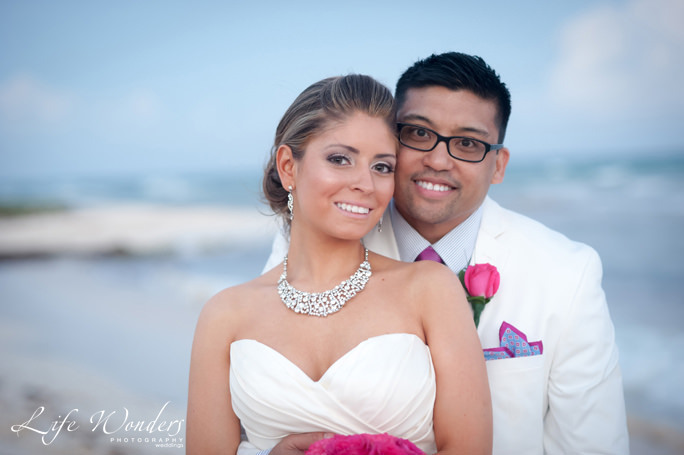 Beach wedding photography is more than just photography knowledge and experience. I will ensure you look your best in your wedding photos by creating a fun and relaxed atmosphere during our photo shoots.